Elections are surveys and ballots are a form of questionnaires. 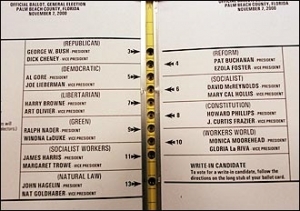 So, as a survey designer and trainer, I look at elections and the new push for “ranked choice voting” through a bit of a different lens than most, dating way back to the infamous butterfly ballot in Florida in 2000. A movement is afoot to change our election process to what’s called “Ranked Choice Voting” (RCV). It’s a different voting process with some purported benefits – and some not discussed shortcomings. Thankfully, the 2018 San Francisco mayor’s race is now leading to a discussion of the shortcomings. Reduction or elimination of “strategic” voting. In a nutshell, here’s the concept. Today when you cast a ballot, you vote for one person for an office. (For the moment let’s put aside some elections where multiple people are elected.) Generally, whoever wins the plurality of votes wins the election. In some situations, a majority vote is required to win. If no one gets a majority in the first round of voting, a second round is held among the top two finishers. With RCV that second round is unnecessary. Under a ranked choice voting system, a ballot would have multiple columns representing a 1st choice, 2nd choice, and 3rd choice. The voter selects candidates for the various choice levels. For example, I might select Cynthia as my 1st choice, Sam as my 2nd choice, and Pat as my 3rd choice. Pat would be the winner, which presumably is how the runoff would have gone. Maybe. That presumes that voters seriously thought about their 2nd choice votes and that Cynthia’s voters would have shown up for the final election. These instructions point out some of the shortcomings of ranked choice voting. Respondent annoyance. If the list is long, ranking every item can be tedious, and the difference in preference after the first few is likely trivial. I recently saw a survey that asked to rank order 19 (sic) items!! You can be certain that after the first 5 or so were ranked by respondents, they were then just clicking on buttons to get it done. Respondent error. Think about the butterfly ballot. No matter how clear the instructions, some people would screw it up. Fact is, instructions on surveys or ballots are like safety instructions at the start of an air flight: no one pays attention to them. Same here. On a paper ballot, some people will vote for two 1st choices or vote for no 1st choices – maybe as a way of saying they don’t really like any candidate. Such ballots would be declared invalid for that office election. Even voting for the same candidate for 1st, 2nd, and 3rd choices would invalidate the ballot. Is that fair? Or do we want to look for dimpled ballots and count chads? A friend of mine in Maine, which uses RCV, told me that he screwed up his ballot for the first time in his life. Electronic voting systems may have safeguards that will prevent these mistakes, but then we increase the annoyance factor. The error messages will lead some to just skip the voting. I will suggest this will be particularly true for older voters whose faculties have been lessened by time. You might think I’m raising a non-issue. I’m not. I have followed electronic survey tools since their inception in the late 1990s. The format for ranking questions constantly has been in flux as designers try to find a way of presenting the question to respondents that avoids error and annoyance. Formats include: a matrix of radio buttons, drop down boxes, drag and drop, among others. SurveyMonkey I believe has changed this question format three times in the past 5 years. I have tried rank choices in surveys and have had to throw out the question’s data because there was too much error in the responses, making the findings meaningless or distortive. Transparency in Ranked Choice Voting – What If There’s a Bunch of Candidates? The simple example of three candidates for an office makes ranked choice voting seems easy to understand and transparent. Transparency is important. If an electorate can’t understand how someone won an election, faith in the democratic process is undermined. What if there’s a bunch of candidates, which certainly is the case for most all major offices. The Florida butterfly ballot had ten candidates for President. The concept, according to the Ranked Choice Voting website, is to iteratively eliminate the “candidate with the lowest number of votes.” So, in a field of, say, 10 candidates where no candidate gets a majority in the first round, the candidate who got the fewest 1st place votes would have his/her ballots examined for those voters’ 2nd place votes. Those votes would be allotted to the remaining candidates as indicated. The order of candidates could change with each allotment of 2nd place votes. The total count of votes will go down because not all voters will have made 2nd place selections, meaning the 50% majority threshold likely will drop with each round. How transparent is this process? Imagine election nights where our esteemed news anchors try to explain how someone got elected!! This will make explaining the US Electoral College seem like a piece of cake. And what about the 3rd choice votes? How do they come into play? The Ranked Choice Voting website is silent on that. I would humbly suggest that if an election outcome relies on 3rd place votes, it would be better to flip a coin. Candidate D wins with 54.3% of the “vote” ! How fair is this process? The above may be an unlikely and uncommon scenario, but could it happen? Sure! Would it be “fair” for a 4th place candidate to win an election because he or she was the second choice of a lot of voters? Only if you’re a supporter of Candidate D! Ranked choice voting has a conceptual problem. We know the voters’ order of candidate preference, but we don’t know the relative preference. If this were the case, it’s now even less fair for Candidate D to win based on those lukewarm 2nd place votes. You can expect losers to raise such issues – legitimately. To measure relative preference for each candidate – versus rank order preference – we’d need to use rating scales for each candidate. We’ve all seen those on surveys; you know, the 1-to-10 scales. Would we want to choose candidates based on the highest rating? But you can expect attempts to “fine tune” RCV, which will probably make elections less transparent. Here’s an article that discusses different ways of measuring preferences. I was at an event recently where the Ranked Choice Voting folks had a booth. A gentleman button-holed me to pitch RCV. He didn’t understand ordinal versus categorical data so our conversation didn’t last long. He was frustrated that I would challenge the alleged superiority of ranked choice voting on conceptual grounds. One claim he made was that RCV would eliminate “strategic voting” and make candidates appeal beyond a narrow base. In reality it may increase strategic voting, and ranked choice voting will likely lead to wholesale changes to elections. Which may be the point. I suspect that campaigns will quickly tell their ardent supporters to not cast any 2nd place votes. That will reduce the possibility of completing the ballot incorrectly, which is the last thing a campaign wants – and why would you help out another candidate? Remember, ranked choice voting says voters don’t have to provide a complete ranking of all candidates. However, campaigns will try to coax lukewarm supporters “in the name of fairness” to “cast a complete ballot.” That might help get their candidate over the top in the runoffs. We will also likely to see a proliferation in the number of candidates with some being simply foils to deny a majority and get to the RCV runoff where who knows what could happen. Remember JFK’s first congressional race. His father, Joseph P. Kennedy got a Joseph Russo to run whose name was identical to someone viewed as a chief opponent, splitting his vote. With RCV Why Would You Bother with Primary Elections? Ranked choice voting may eventually lead to calls to eliminate primaries and move to what are called “jungle elections” with no party affiliations. California is now doing that with its primaries to be followed by a general election between the top two winners, but with RCV that second stage becomes less necessary. Maybe that will be good, but we should be aware of possible unintended consequences, especially as it affects political parties. Let’s remember how campaign finance “reform” has reshaped our election processes, pushing money to less accountable, non-party groups to wage the election battles. We know from experience that loopholes will be found in all well intended systems. And the law of unintended consequences will rule forever. But Who is the Ranked Choice Voting Resource Center? Now pardon me for being suspicious, but who’s funding this movement? The RCV website lists 4 members of a “project team,” but that’s it. This is an extensive movement. The website does not ask for donations, but someone is funding this. Who? Certainly not the 4 people on the project team. As I explored the RCV website, I noticed a startling omission: there’s no street address in the footer, which is a big no-no in Google search engine rankings. From where does this project team operate? There’s only a phone number, and it’s a phone number “shared” with FairVote.org. Why the obfuscation? Why do they hide the connection between FairVote and RCV? By not being straight about the connection, they are inviting questions. If you look at the biographies of the people at FairVote, you’ll see positions at campaigns but without naming the campaigns. Even their LinkedIn profiles have been cleaned of candidate affiliations. If this were a bi-partisan group, then showing contrasting affiliations would demonstrate that bi-partisanship. FairVote has all the trappings of a partisan effort disguised as non-partisan. What’s the end game? I go back to the campaign finance “reform” issue. Someone figured out that so-called “527 committees” could fund elections and be in compliance with McCain-Feingold. Did McCain-Feingold reduce the influence of money on our elections? Hell no. It just pushed the money into the shadows. What will be the unintended consequences of ranked choice voting? Let’s let a few states be our Guinea pigs before we fall for what appears to be a partisan ploy.